Dress Yourself Skinny: Dressing The Body You Have, To Look Like The Body You Want! The wrong clothes can make you look 10, 20 or even 30 pounds heavier that you really are. – Learn the critical dressing mistakes that cause you to look bigger than you really are. – Discover the essentials every woman must embrace to dress herself skinny. – Make shopping and dressing a breeze with fool-proof diagrams of the styles that are perfect for YOUR body-type. – If you are on a weight-loss program, reveal your results faster and stay inspired to reach to your target size. The right choices can literally change your body right before your eyes! 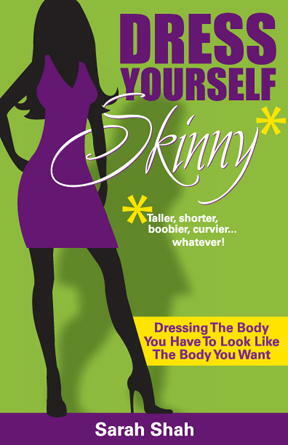 Paperback – Order the paperback version of Dress Yourself Skinny, get the companion Workbook (printable PDF) FREE! – $24.95 ($34.90 value) Our Order Page Is Under Rreconstruction…please call (713) 686-8587 or email Sarah@SarahShah.com to order. This Workbook is a companion to Dress Yourself Skinny. It provides additional support during your transformation and guides you as you determine your body type, sort your wardrobe, develop your shopping list and record the emergence of your new body. Our Order Page is Under Reconstruction…please call (713) 686-8587 or email Sarah@SarahShah.com to order. Below are posts with more tips, information and products to supplement the book.